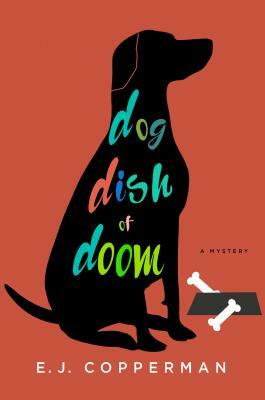 Cozy fans and animal lovers alike won't be able to keep their paws off Dog Dish of Doom. Laugh-out-loud funny, E.J. Copperman's series debut is "lots of fun" (Library Journal, starred). Kay Powell wants to find that break-out client who will become a star. And she thinks she’s found him: His name is Bruno, and he has to be walked three times a day. Kay is the Agent to the Paws, representing showbiz clients who aren’t exactly people. In fact: they're dogs. Bruno’s humans, Trent and Louise, are pains in the you-know-what, and Les McMaster, the famous director mounting a revival of Annie, might not hire Bruno just because he can’t stand them. This becomes less of an issue when Trent is discovered face down in Bruno’s water dish, with a kitchen knife in his back. Kay’s perfectly fine to let the NYPD handle the murder, but when the whole plot seems to center on Bruno, her protective instincts come into play. You can kill any people you want, but you’d better leave Kay’s clients alone. A New Jersey native, E.J. has written for such publications as The New York Times, Entertainment Weekly, American Baby and USA Weekend. Night of the Living Deed is the first E.J. Copperman novel. E.J., having worked as a newspaper reporter, teacher, magazine editor, and screenwriter, writes stories that combine humor and mystery with just the right amount of spooky supernatural happenings and a large doses of Jersey attitude. The fact is, E.J. Copperman is the pseudonym of a crime fiction writer who likes to specialize in making people laugh while delivering the suspects, clues, red herrings and plot twists that keep the pages turning. "Absolutely charming, totally enjoyable...an almost perfect novel...sparkles with Cohen’s light touch and sure hand. Bravo. —Aunt Agatha’s (Ann Arbor, MI) Newsletter Chosen as one of the Top 5 Mysteries of 2014!